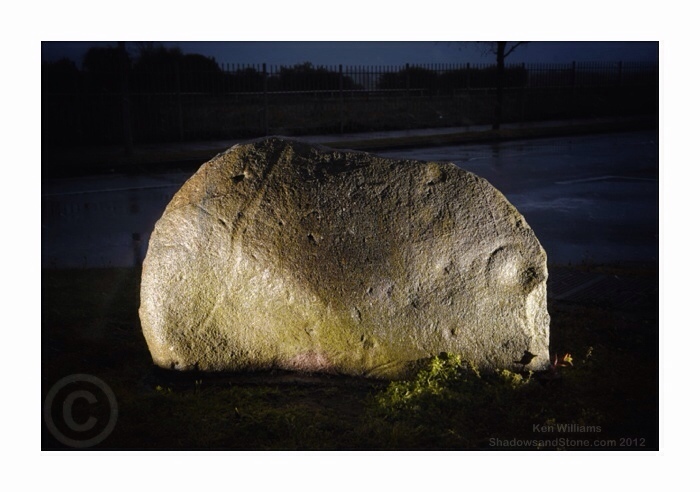 A few weeks ago a photo was posted on a Facebook page of a stone outside a housing development in Naas, Co. Kildare. A passerby noticed a quite distinct partial ring around a wide bowl-like depression on the edge of the narrow granite stone, which is now set into the ground with it’s opposite face ground smooth, polished and engraved with the name of the estate. It looked quite clear from the photo that, as the poster suspected, this may be an unrecorded example of prehistoric rock art. Since I was passing today I popped by to take a look, despite the high winds and driving rain! Naturally enough I didn’t hang around too long in these conditions so a close inspection of the markings to try and determine if possible whether a stone or metal tool was used to make the large cup and ring, and any of the other possible cupmarks, will have to wait. I did though manage to set up a couple of flashes for the rather hasty shot above. The provenance of this stone is as yet unknown, however a similar style of carving, with a very large cup mark/basin surrounded by a single ring, is known to exist on a hillside near Bagenalstown in Co. Carlow. Would be great to hear from anyone who has any info on this stone. I haven’t been able to track down the original post on Facebook either so if you discovered this great find, can shed any light on the carvings or have any leads, go ahead and post a comment below or make contact through the Facebook page. This entry was posted in Prehistoric Ireland, Rock Art. Bookmark the permalink. Hi Ken, I found your blog yesterday so I’m reading all your posts. Did you find out anything more about this stone? Was it carved with a stone or a metal tool? Also what do you guys usually do when a new stone is found? Hope you wan’t mind me asking so many questions. Hi Sarka, I haven’t heard anything more about this stone since, not certain what kind of tool was used as it was dark and wet when I saw it! Must drop by next time I am passing and take a closer look. I passed on the location to someone in the National Monuments service so it may have been inspected by now. come back very soon. I want to encourage one to continue your great posts, have a nice day!